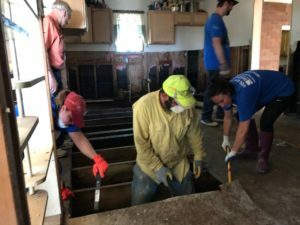 A Disaster Relief team tears out some flood damaged subflooring. Civil authorities want, and many times require, on-site responders to be trained and affiliated with a known disaster response organization. The Arkansas Conference has UMCOR certified trainers to assist those who want to respond on-site to become trained, certified, and badged. Note that this requires criminal background checks. These checks are done in compliance with Arkansas Conference Safe Sanctuary policies and due to the vulnerable state of those we serve who have been affected by disaster. 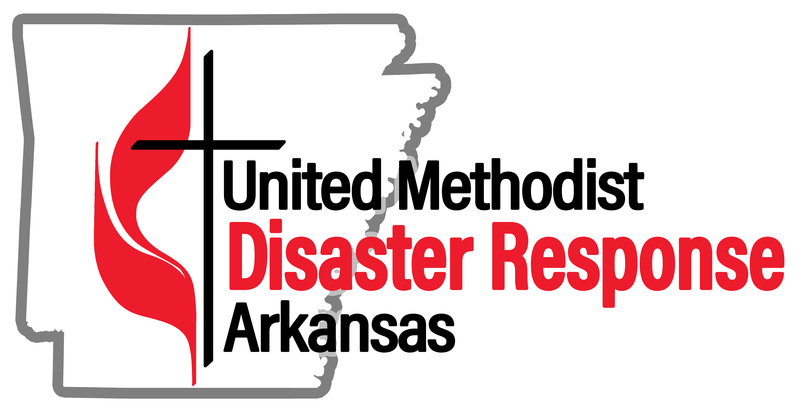 When disaster strikes, United Methodists respond – with love, with prayers, with time, with labor, with supplies, with funds. Scripture guides us in how to respond to disaster, tragedy, and trials. Below are key scriptures we confide in our hearts for these times of hurting and sorrow. God is our shelter and strength, always ready to help in times of trouble. So we will not be afraid, even if the earth is shaken and mountains fall into the ocean depths; even if the seas roar and rage, and the hills are shaken by the violence. I consider that what we suffer at this present time cannot be compared at all with the glory that is going to be revealed to us. We know that in all things God works for good with those who love him, those whom he has called according to his purpose. Let us give thanks to the God and Father of our Lord Jesus Christ, the merciful Father, the God from whom all help comes! He helps us in all our troubles, so that we are able to help others who have all kinds of troubles, using the same help that we ourselves have received from God.